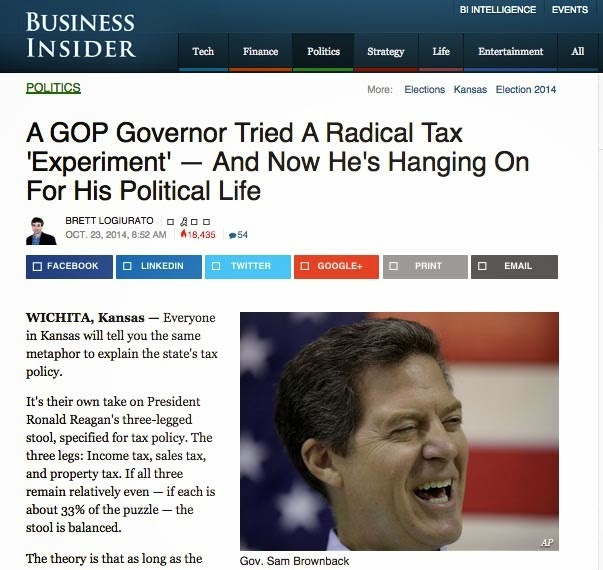 Each day, the string of national news articles about Kansas finances continues unabated — including recent stories from The New York Times, The Washington Post, NPR’s Planet Money, Rolling Stone, Business Insider, and The Daily Show, just to name a few. It’s as though our financial policy has six toes and three ears and everyone wants to have a look. Financially, Kansas has been taken way out to the very end of the spectrum among states. We Kansans have become the subjects of the now infamous “fiscal experiment.” We have gone where other states don’t go. No wonder those outside Kansas are interested in how we are conducting business. However, for those of us who live in Kansas, the fiscal experiment is far more worrisome than it is interesting. State revenue fell $688 million in fiscal year 2014 and continues to decline in FY 2015. Economically, we have underperformed our neighboring states. Our lawmakers face a huge budget imbalance that enlarges to $672 million in FY 2015 if revenue just stays flat — but in the first three months of FY 2015, revenue is falling. Education and other key services are in peril. Kansas badly needs a change of direction. The damage from the fiscal experiment has already been incalculable and has the potential to get far worse. Turning things around though, will be quite challenging. It will require leaders who know Kansas and have great skill at working within Kansas government — leaders who will take a bipartisan approach and govern with a strong coalition of Democrats, Republicans, and Independents. An understanding that Kansas must be fiscally healthy in order to achieve a quality education system will be critical. Paul Davis and Jill Docking have those attributes. They are joined and supported by Kansans from all parties. Many current and former Republican and Democratic officeholders publicly voice enthusiastic endorsements of Davis and Docking. Educators from across Kansas have rallied in support of Davis and Docking, knowing that the future of Kansas education rests on a change in political course. Kansans committed to running human service programs in a respectful way also back Davis and Docking. Citizens who would not dream of “experimenting” on their own personal finances in such a risky way, have signed on with Davis and Docking to get Kansas back on a responsible track. The fiscally responsible thing to do now is to vote for change — vote for Davis and Docking. Our state has been taken out to the edge. Davis and Docking, walk us back to a moderate, commonsense, practical Kansas. A year ago, the Brownback administration cut off $70,000 of federal grant funding that local charities were using to connect Kansans who need food with the federal food stamp program. Stopping the grants did not save Kansas taxpayers a dime. Nor did it help the Kansas general fund. But that financial decision did hurt hungry Kansans and the charities trying to help them, and denied the Kansas economy some federal dollars that now flow elsewhere. Such a decision, which saves no money, takes dollars out of the Kansas economy, and hurts Kansas citizens all at the same time, is fiscally irresponsible and also just plain mean. The governor has also kept Kansas from expanding Medicaid eligibility to more people. For the first three years, the federal government would have paid the entire cost of Medicaid expansion and then 90 percent of the cost after that. As many as 180,000 Kansans could have benefitted and received health care coverage. A majority of states have already done an expansion. The constantly running “ticker” on the Kansas Hospital Association website shows that Kansas has missed out on over $270 million federal dollars just since January 1, dollars that would have helped Kansans, the state's hospitals, and our economy. 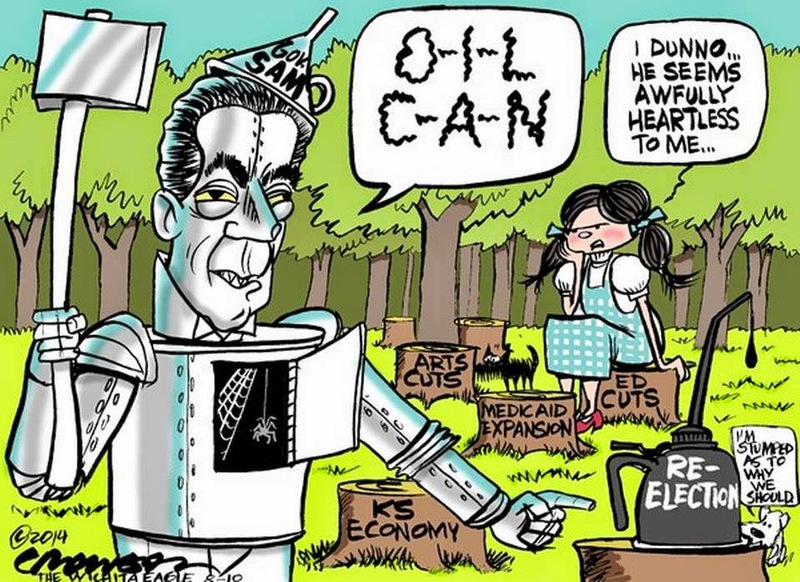 The decisions to cut outreach grants and deny Medicaid expansion came in addition to the Kansas fiscal experiment. The state sales tax rate was kept high, which means Kansans pay more for their food. But income tax rates were lowered sharply, and the income for many businesses, including some very large businesses, was exempted from state income tax entirely. The net result has been a dramatic drop in state revenue, down $688 million in FY 2014 and dropping further in the first quarter of FY 2015. Expenses are hundreds of millions above receipts. The savings account being used to pay the difference is almost gone. 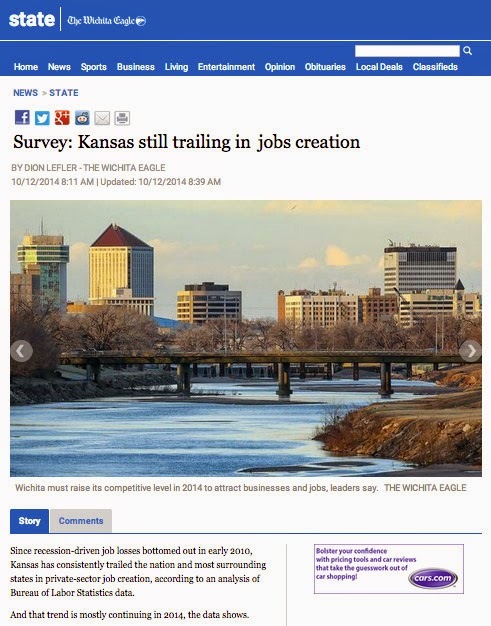 The premise of the tax policy changes was to create jobs and economic activity, but Kansas has been surpassed by its neighbors in job creation. The Brownback policies have shifted more tax responsibility toward low-income Kansans, and at the same time have left Kansas in a financial position where we must cut back and pull away from critical education and service programs. The financial decision the governor made to implement the experiment was fiscally irresponsible and utterly reckless. Don’t reward fiscal irresponsibility. Return Kansas to a commonsense, practical approach. In fiscal year 2014, receipts fell $688 million from the previous year. Now three months into FY 2015, revenue is coming in below the FY 2014 level. That has very serious implications. Travel through the numbers, looking first at a comparison of first quarter collections. Individual income tax collections are down $51 million from last year, a 9 percent drop. Total revenue has fallen $33 million for the quarter. Corporate income tax collections were up. That’s not too surprising given that tax rates for full corporations have not changed. The exemption from state income tax given to LLCs and S Corporations affects individual income tax collection amounts. The Department of Revenue has been actively trying to settle outstanding tax cases to pump up receipts, so there is likely one-time revenue in the first quarter FY 2015 totals. Plus, the state is $26 million behind on planned transfers out of the State General Fund, transfers which, if made, would have reduced the FY 2015 total even more. 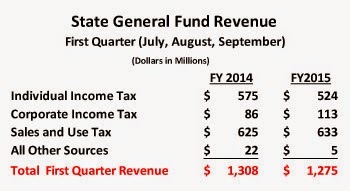 The “official” FY 2015 profile for the State General Fund (shown below) assumes revenue will be $321 million higher than the amount actually received in FY 2014. Even with that optimistic assumption the ending balance is projected to be only $29 million. 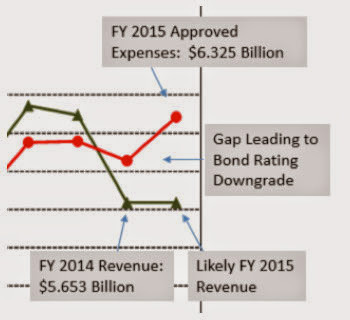 If the revenue estimate were changed to assume no growth from FY 2014 to FY 2015 (shown below), the ending balance immediately goes far below zero. Remember, FY 2015 first quarter receipts are actually below the FY 2014 level right now, not flat. The State General Fund cannot go under zero, so a scenario like this means mid-fiscal year budget cuts. More importantly, this signals big trouble for the future. Current expenses are set at $6.325 billion. If FY 2015 revenue does not grow — which is more and more likely — it will be $672 million below expenses: a huge structural budget imbalance. But future expenses will keep going up, while at the same time, even more tax rate reductions are scheduled to kick in. 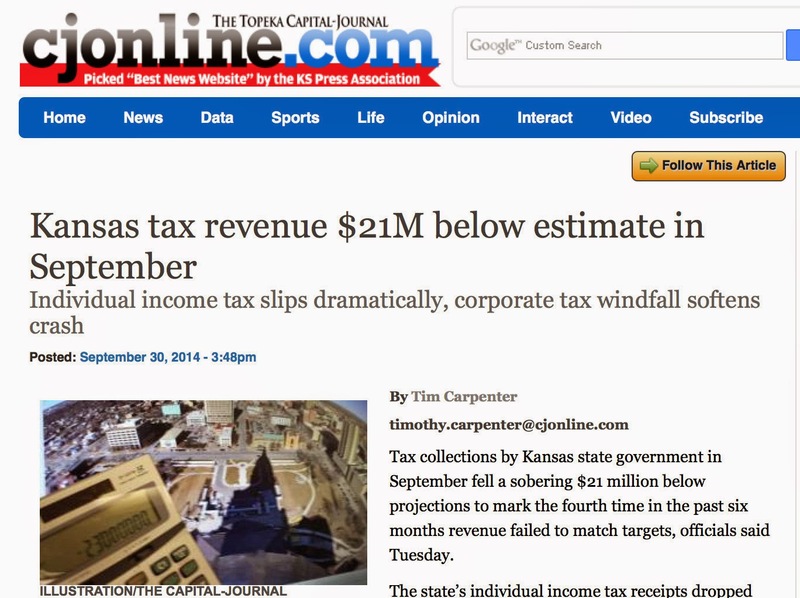 Kansas is on a financially irresponsible path that will be very painful and difficult to fix.